affected by the recent flood event. 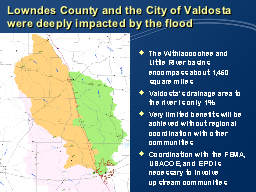 The Withlacoochee Wastewater Treatment Plant flooded in its current location in the unincorporated area of Lowndes County, which is at the bottom of a 1,500 square mile drainage basin and the source of most of the flood waters received at the plant and throughout the city. The city's Water Treatment Plant is located on Guest Road, over 15 miles northeast of the Withlacoochee Wastewater Plant, and the river flows south from the Wastewater Treatment Plant. 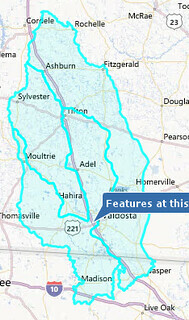 There is no known connection between the Withlacoochee River south of the Withlacoochee Wastewater Treatment Plant and the Floridan Aquifer, where the City of Valdosta withdraws its drinking water for its citizens. Furthermore, the city's seven wells, which withdraw the water from the aquifer 300 feet below the surface, are located near the Water Treatment Plant, adjacent to and within Freedom Park. With the flood waters beginning to recede, the city has initiated cleanup efforts in low-lying and flooded areas, which include disinfection where necessary. Cleanup efforts will continue for several days or until all affected areas have been disinfected and cleaned. Until then, the city continues to encourage the public to avoid any contact with the flood waters for their health and safety. For more information, contact the Public Information Office at (229) 259-3548. Sign up for E-News at www.valdostacity.com/publicinformation and stay in tune with the news and events happening within our city.